Being Frugal and Making It Work: FREE LEGO Lemonade Stand - LEGO Friends Launch n’ Build Event! - Tomorrow February 4 Only at Toys“R”Us! 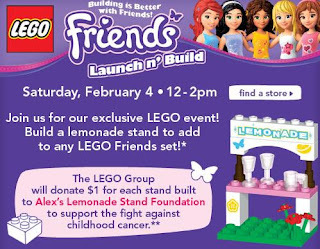 FREE LEGO Lemonade Stand - LEGO Friends Launch n’ Build Event! - Tomorrow February 4 Only at Toys“R”Us! My daughter absolutely loves LEGO's and has a nice collection!! Tomorrow ONLY at Toys“R”Us, you can get a FREE LEGO Friends Lemonade Stand! Join the LEGO Friends Launch n’ Build Event! Saturday, Feb. 4 Only at Toys“R”Us from 12 - 2pm! *This special FREE LEGOS event is intended for children ages 5 and up. Parental supervision required at all times. All giveaways and event materials available while supplies last and distributed to participating children only. Limit one per child. Quantities limited; no rain checks. LEGO and the LEGO Group 2012 The LEGO Group. **Up to $10,000 to support Alex's Lemonade Stand Foundation. ‡Limit one per guest. Quantities limited; no rain checks. What a great event! Thank you for sharing this Bridget, I passed it on to my readers.